Trump’s announcement came one day after release of a declassified government report on Russian efforts to influence the presidential election. The report predicts Russia isn’t done intruding in U.S. politics and policymaking. Trump wants to improve relations with Russia and repeatedly has denounced intelligence agencies’ assessment that the Kremlin interfered in the election, when he defeated Democrat Hillary Clinton. But the report released Friday explicitly ties Russian President Vladimir Putin to the meddling and says Russia had a “clear preference” for Trump over Clinton. Coats, an Indiana Republican, will await Senate confirmation to head the office, which was created after the Sept. 11 attacks to improve coordination among U.S. spy and law enforcement agencies. 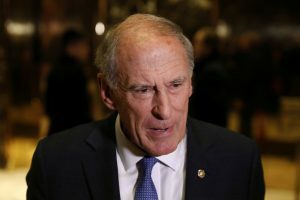 Coats now finds himself in line to be at the center of an intelligence apparatus that the president-elect has publicly challenged. Trump’s team has been examining ways to restructure intelligence agencies as part of an effort to streamline operations and improve efficiency, but Coats’ nomination could ease fears that Trump would push for a significant overhaul. READ NEXT: Trump’s cabinet is mostly white and male. What will that mean for policy? Coats, 73, is a Capitol Hill veteran who served eight years in the House before moving to the Senate in 1989 to take Dan Quayle’s place when Quayle became President George H.W. Bush’s vice president. Coats stayed in the Senate until 1998, then left to become a lobbyist. After serving as U.S. ambassador to Germany under President George W. Bush, Coats joined the international law firm of King & Spalding, helping lead the government affairs division and lobbying for pharmaceutical, defense and energy companies. Coats, who earned $600,000 in his final 13 months at King & Spalding, downplayed his lobbying work when he returned to Indiana for a successful Senate comeback bid in 2010. He served one term and did not seek re-election last year. Coats was a vocal critic of Russia and pushed the Obama administration to harshly punish Moscow for its annexation of Crimea in 2014. When the White House levied sanctions, the Kremlin responded by banning several lawmakers, including Coats, from traveling to Russia. Trump received a briefing Friday from intelligence officials on the classified report about Russian interference in the 2016 election, and he later told The Associated Press that he “learned a lot” from the discussions. But the president-elect declined to say whether he accepted the officials’ assertion that Russia had intruded in the election on his behalf. This report was written by the Associated Press.